Cheval Calico House is nearby Workshop Coffee Co.
People often do a lot of research before going to a restaurant. They care about quality, price, localization, reviews, ambience. However, on the moment of a simple coffee and cake, many end up going anywhere and having a cup of coffee not worth of their time. The big chains can be practical for being everywhere. But what about the real good coffee shops, that brew their own coffee and bake their own cake, and are independent to do things in a new way? This delightful coffee house is nestled down a lane in Fitzrovia. Lantana’s Australian ownership is reflected in the brunch style dishes, flat whites and relaxed atmosphere. It runs an In and Out operation with the premise being split into two; one for takeaways and the other half for sit down meals. The cakes are particularly good and breakfast dishes always delight. Coffee is sourced from Monmouth Coffee (see below) and the benches outside also mean this is a great spot in summer. Caravan, run by the former chef of The Providores, is located on Exmouth Market. This establishment serves a variety of international inspired dishes with all food being sourced seasonally. It also boasts its very own coffee roastery in the basement, which supplies some of the best coffee shops in London. The open plan layout and double facing glassed front make this an ideal location for enjoying a vibrant part of London. Caravan has a second outpost on Granary Square behind King’s Cross station, Caravan King’s Cross, both of which serves some of the best brunch in London. 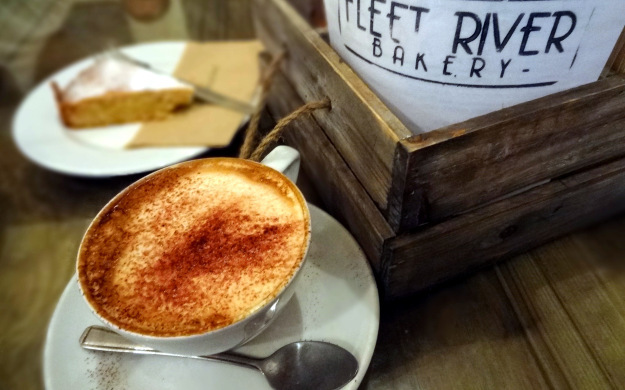 Fleet River Bakery, sitting neatly between Holborn and Lincoln’s Inn Fields, offers a fine combination of baked goods, well made coffee and great food made on site. The space is split over two floors with photography adorning most of the walls. The result means it’s as welcoming as it is spacious. The lunchtime rush can be a bit overwhelming so this is best enjoyed in the morning with some of the best coffee in London. 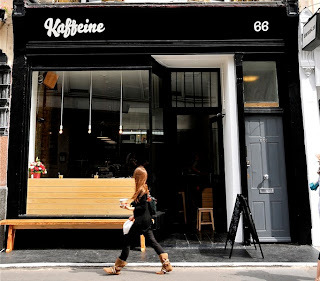 The people at Kaffeine know how to make a seriously good cup of coffee, maybe even the best coffee in London. Whether you want a smooth cappuccino or a perfectly blended flat white, the accommodating and knowledgeable staff always deliver. The selection of food is very good with an emphasis on healthy, seasonal food alongside their regular baked treats. The space itself is small but perfectly formed with a good vibe. This is a great spot near busy Oxford Street if you’re looking for a caffeine fix. 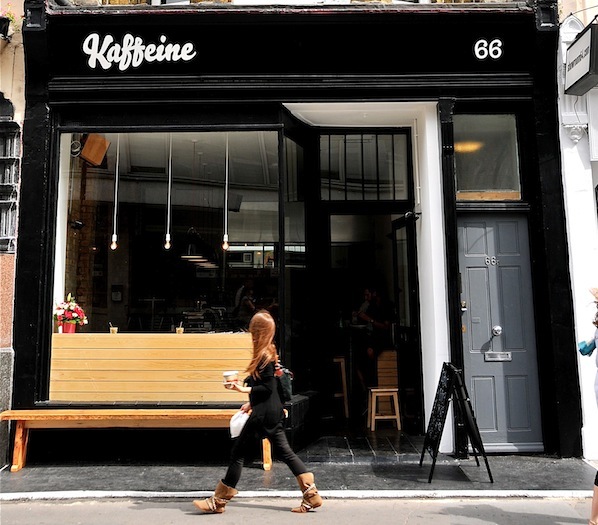 Placed on a busy corner of Clerkenwell, this bare bricked coffee shop knows a lot about coffee. If the impressive roastery at the back isn’t convincing enough then the above the norm coffee machine will quell any further doubt. Each cup at the Workshop Coffee Co. is brewed to perfection by baristas who take pride in their work. The space with its communal tables, rough finish and well lit vaulted ceiling offers a good example of London at its trendy best. The unique quirk of this coffee shop is that alongside its serious approach to coffee is an equally serious interest in all things two wheeled. The warehouse style space, serving up Square Mile Coffee, is a good retreat from the hectic buzz of the city. There is a good selection of baked goods and oodles of space to sit down in. If you’re in a rush there is a perfectly placed coffee van outside Look Mum No Hands! serving up coffee to the commuter crowd. Salt is located just off Covent Garden on Great Queen Street, serving up generously portioned food, good service and some of the best coffee in London. They run an artisan bakery that compliments their continually changing menu. The tea is brewed to the right temperature and time, which makes this a great place for any non-coffee drinkers. Beyond the well presented bar area, with a beautifully adorned oven, is a communal seating area if you’re planning on lingering. This popular establishment, with various cafes dotted around central London, is inspired by the growth of farmers’ markets. This approach to food means that their hot and cold offerings are both delicious and inventive. When paired with a great cup of coffee from the people at Hasbean its easy to see why Fernandez & Wells always has a buzz inside their well designed premises. Having started roasting coffee from a basement in Monmouth Street in the seventies, Monmouth Coffee can be considered the original independent coffee shop. They now have two new branches, one in amongst the stalls of Borough Market and another in a warehouse space in Bermondsey. and wish you a good continuation. Wishing you the best of luck for all your blogging efforts.